Ever since I lived in Australia, with a dry climate and a garden with poor topsoil, I've really grown to love using straw and hay bales for gardening. The benefits are many, the bales are cheap, and with a little ingenuity (not much, I promise), hay bale gardening can revolutionize how you grow vegetables and herbs. 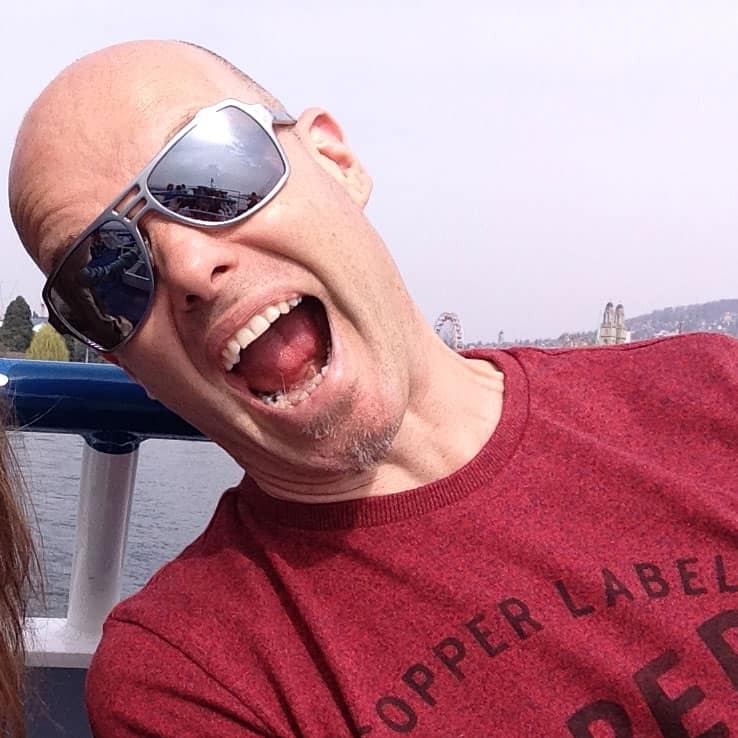 I've worked for many years as an organic gardener and permaculture enthusiast, working on backyard strategies that save me time and effort, but also reduce my water consumption, weeding time etc. Basically, I'm a lazy gardener who wants maximum crops with minimal work. Sound like you? In this article, I'm going to share with you some reasons why you should consider using bales for growing your own vegetables, even on a small scale, provide some clear instructions on adding such beds to your garden (don't worry, they don't have to look like the one in the picture below! ), and the best ways to plant them up. I am sure that by the end of this article you'll be 'chomping at the bit' to give hay bale gardening a shot. Why Using Hay Bales For Gardening Works! Why Plant In Hay Bale Garden Beds? How Often Should You Water Your Straw Bale Garden? There are many reasons, too many to go over, but the incredible thing about straw or hay bales for garden beds is the simplicity, the low cost, and the long-term benefits that bales offer. I mean, have you even even considered that you could turn a $5 bale into a fruitful garden where weeding would be an occasional inconvenience, where plants would flourish, where pests would be an insignificance? To begin with, the best soils for farming tend to be loose. For soil to reach this state, it requires an addition of plenty of organic matter. Straw bales do not compact. This gives plant roots room to breathe. Earthworms which are also critical in the process of breaking down matter do not thrive in compacted soil. Well-aerated roots ensure your plants receive sufficient oxygen. This is important as oxygen combines with food produced during photosynthesis to produce the energy your plant requires. This loosened straw will also eliminate the possibility of a water-logged plant bed. Just like soil regularly trodden on compacts and reduces oxygen supply, so does too much water. A poor draining plant bed will also affect important microorganisms required to break down organic matter. With a straw bale bed, gardeners need not worry about root aeration as much. Areas with poor soils have the most to benefit from bale gardening. Grass clippings have long been used for soil amendment. This is in part due to their ability to add organic matter and nitrogen into the soil. Plants planted in straw bales absorb nitrogen from their surroundings. As long as the bales are not left to dry out, they are in a constant state of decay, giving off nitrogen. Nitrogen is a critical part of chlorophyll, which is in turn important for photosynthesis. 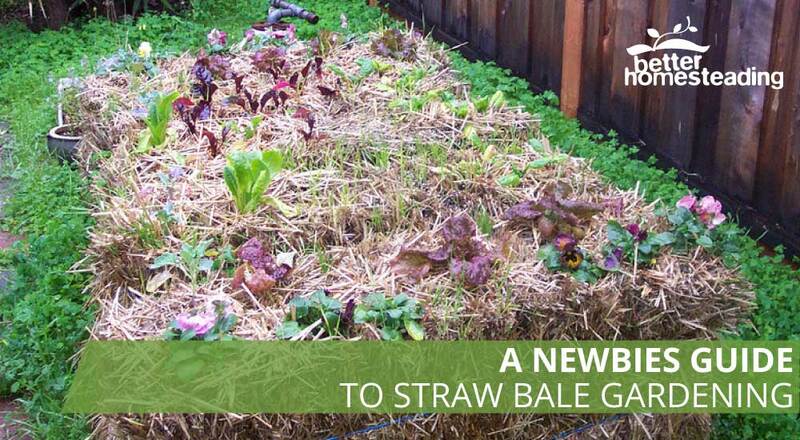 Combined, these factors allow straw bale gardening to work better than trying to enrich poor soils with externally sourced ​soil amendments and conditioners. The technique calls for arranging rows of hay or straw bales in rows. They are then moistened heavily for composting to set in. Fertilizers rich in nitrogen are added to hasten the composting in a process referred to as conditioning of the bale. The composting bales provide a conducive fertile environment that forms a loose textured medium for growing plants. Before planting any plants, straw bales must first be prepared for planting. The process is referred to as straw bale conditioning. Many new to the technique may wonder how to condition straw bales for gardening. The steps below should get you started. Once you have sourced your straw bales, lay them in an area you are sure is suitable for your garden. This will usually be a sunny spot where water run-off will not be an issue. Stacking of bales will not be necessary. An unstacked bale row ought to do. Keep in mind that once the conditioning process begins, the bales will be too heavy to move. So be very sure before starting. For plants that are sensitive to high temperatures, you can also consider setting up your garden in an area likely to receive some afternoon shade. Using bale in its raw form might not bear any results. Converting a straw bale into a growing medium is referred to as conditioning. The entire process that takes a few days from start to finish. The process allows bales to begin composting thereby creating suitable conditions for plant growth. There are many variations to the technique. They mostly only require fertilizer, water and time. Day 1: On the first day, pour 3 cups of milorganite which is an organic nitrogen fertilizer. The fertilizer is responsible for feeding microorganisms that break down and decompose your bale. An alternate mix calls for nitro-chalk, superphosphate, potassium nitrate, Epsom salts sulfate of iron, mixed and sprinkled on your raised bed. This will provide your plants with all the nutrients they will need. Water your bale thoroughly. This will drive the fertilizer deep into the bale. Day 2: Water your straw bales. Rainwater or naturally warmed water works better than chlorinated water. This natural, untreated water supports microbial activity. A few gallons of water should be sufficient to keep your bales moist. Day 3: Add 3 cups of milorganite. Wet the raised bed again. Day 4: Add only water. Day 5: Repeat addition of 3 cups of milorganite and water down your bale. Day 6: By now, your bales should have begun composting. As mentioned, the process gives off heat as one of its by-products. Your bales should feel warm to touch and have the sweet aroma of composting. Moreover, composting releases carbon dioxide. This is very beneficial to plants, especially those in a greenhouse. Day 7 - 9: Only add half the amount of fertilizer for the three days. Keep watering your bale each day. Do not let it dry out to keep composting going. Day 10 and 11: Use a cup of complete fertilizer to each bale. Addition of a complete fertilizer, such as 10-10-10 type of fertilizers adds the much need phosphorus and potassium nutrients. Water your straw bales. Day 12: Your straw bale should now be conducive to planting. It should still be warm to the touch. However, if warmer than bath water, hold off planting for a day or two before planting to avoid scorching your plants. The process of bale conditioning eliminates any leftover grass or weed seeds. As bale is being conditioned, straw is broken down by microbes. The process gives off heat as one of its by-products. This is enough to leave your growing medium sterile and free from nutrient hungry weeds. The extra height of a packed straw bale will save many the agony of having to bend over for hours on end while tending to plants. Unlike using soil as a growing medium, the structure does break down after a year or so as straw decomposes. Straw bales do not become water-logged as would soil. Any excess runs off. Vegetables such as lettuce do not do well in water-logged media and as such can do better in straw bale gardens. Though fertilizers rich in nitrogen are required to break down the straw bales, there are hardly any more nutrients added. When the straw breaks down, there are plenty of nutrients for your plants. Once it has done its job, the decomposed straw can no longer stand upright. At this point, it can still be carried off and used as growing media in pots and windowsill planters. You can also add it to your compost heap after removing its twine. Further, gardeners living in areas with less than ideal soils (clay or sand) need not spend much on resources, enriching the soil. They can get started on their gardens without much extra work done using this technique. The decomposition of straw will generate enough heat that allows planting to start one to two weeks before spring. Nonetheless, planting should not be done while the straw is too hot. Wait until it is just warm before planting. Once the straw bales are cool enough you can begin planting. Using a trowel, pry open a hole in the straw bale. Transplant plants can then be put into the hole and cover with good potting mix. For those who will plant from seed, begin by pouring a layer of planting mix. Lay your seeds in the soil as directed at the back of the seeds package. For this technique to bear fruit, proper watering practices are a must. Soaker hoses have worked pretty well for most gardens as they make watering much easier. Gallon milk jugs with holes at the bottom and soda bottles turned upside-down near the base of your plants. Seedling beds should be watered frequently. Once your plants are established, reduce this frequency. 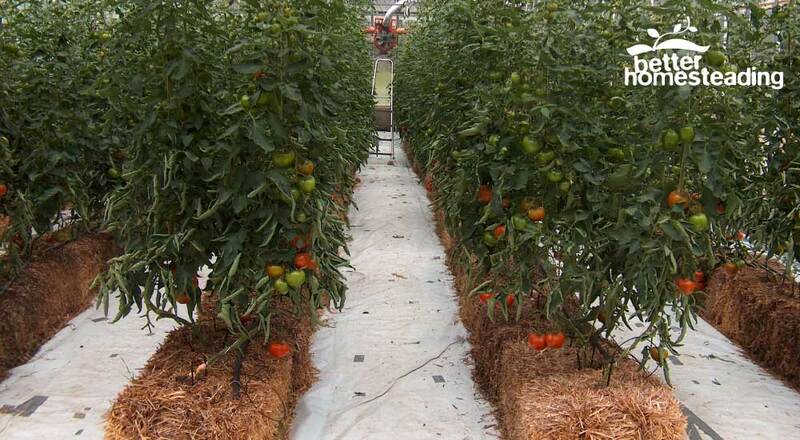 For established plants, water bales that begin to dry-out near areas with plants. Keep a close watch during hot months as there is a much higher likelihood of your bales drying. Joel recommends no more than a minute under the hose per session. Any more will just lead to run-off. For hotter months increase the frequency, not the amount per session. 1. Liaise with your local extension officer to determine which would be the best time to start planting. Plant too early before spring and your plants have a higher chance of being attacked by frost. 2. Lay your straw and hay bales for gardening cut side up in the preparation phase. This makes it easier for fertilizer to work its way into your straw bale. Water also has an easier time soaking into your bale. 3. During the conditioning phase, add chicken, sheep or other organic farm compost to your bale. Farm compost is not only a rich source of nutrients, but it will also assist in better bale composting. 4. Give your plants a nutrient boost about once a month for a better harvest. 5. The bigger your plants get, the more they weaken the structure of your bales. If budget constraints allow, reinforce the sides of your raised garden using wooden frames or wireframes. This will retain the body of your bale longer. Alternatively, dig a trench as wide as your bale. You can also line the shallow trench with polythene which will help retain water that runs off. Tomatoes are quite popular with straw bale gardeners. This is attributed to their success growing. There is not much difference growing them in rich earth. The only challenge is that like vines, they will require support driven into the ground. Do not use metal-based supports as these get too hot on sunny days and may dry out your plant. Fence posts with electrical wires wound tight between them is an inexpensive way to create a trellis. For added rigidity, 2“x4“ members can span between the posts to prevent them from tipping over as your tighten the wires. In any case, start off your tomatoes in a pot. When ready to transplant, spread open a hole wide enough to fit your plant and its potting soil. Plant 2 to 3 tomato plants on each bale. Once in the bale, cover it at the top with potting soil. Feed your tomatoes regularly with organic feed such as sheep’s manure tea. If tomatoes are what you have in mind, ensure you set up your garden in a sunny spot. Small tomato fruits fair better as big fruit varieties may be difficult to support properly. Most favored varieties of flavorful black cherries, carmellose, and sungolds. Vegetables, fruits, and flowers are recommended for the first year of planting in bales. You can still get an extra year from your bale especially if you bought dense bales, to begin with. Nonetheless, these bales would not be able to warm up again as in the first season. The would, therefore, be unsuited for tomato or other warm season plants. For the second season, potatoes and other root crops would fair better. Potatoes grown in bales are clean come harvest time. Moreover, they allow gardeners to harvest without disrupting the roots system. After harvesting crops from the previous season, your bales should still have enough nutrients to grow a batch of potatoes. If you, however, prefer starting off with potatoes on fresh, conditioned bales, take caution not to plant in hot hay or straw bales. In new hay or straw, spread bale layer to create a hole for planting. Check that the bale is warm and not hot. Having pre-cut your potatoes to have sections with eyes, place 4 sections per bale. Each should be planted about 5“ deep. The plants should be planted at the center to prevent them from pushing out from the bale’s sides. For a second season crop, pile up two used bales to garner sufficient volume for planting. Consider adding compost, gardening gypsum and worm castings to your bale heap would be of benefit. This is because a lot of the nutrients will have been used up by the previous season’s plants. Addition of these nutrients will improve your harvest. Addition of fish and seaweed fertilizer at least every fortnight is also recommended. Planting about 4 strawberry plants per bale is enough to keep your supply constant. To keep your strawberries in top form, they too should be planted where they are able to receive full sun for at least 8 hours a day. Pick a variety that does not use runners to propagate. The alternative would be to trim any runners that pop up. This will reduce competition for nutrients thereby leaving your plants healthy and strong. 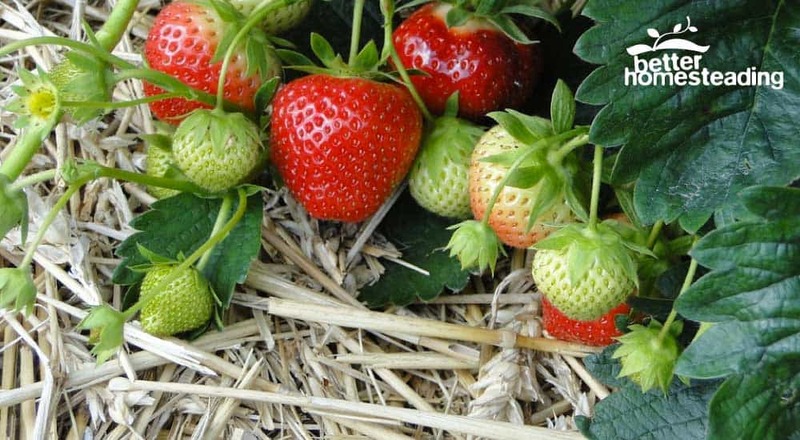 Away from damp earth, strawberries thrive in the loose structure of straw bales. 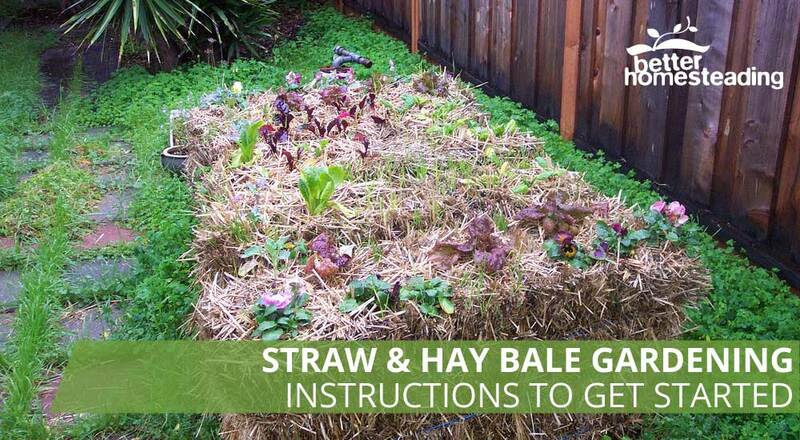 Here's a great educational video about gardening with straw bales. Hope you enjoy it!! As is evident, straw and hay bales for gardening can work for almost any situation. You do not need to have too many straw bales to get started on your garden. A couple ought to be enough to experiment on. Other good options for your garden include most plants from the squash family, herbs and leafy greens which have all performed excellently on straw bales. You could additionally plant flowering plants to the side of your bales. marigold and borage look great in a garden. They also serve a different function. Bees and other pollinators will frequent your garden. Lacewings, which devour pests will also be attracted to your garden by the flowers. Carried out long enough, these raised bed will create grounds for every gardener’s dream, a no-dig garden, where you will be planting in pure humus. This can be achieved over a number of seasons. I really do love straw bale gardening, it's a great way to grow food for your family. If you haven't tried it, give it a shot and let me know how you get on.